← Don’t Drop It On Jordan! New Yesterdays is now available in paperback from Create Space, an Amazon company. “That is one scary house!” declared the red-haired boy for at least the thousandth time. Every time he played there he felt a thrill of excitement race up his spine. It was the same giddy sensation he got from watching the gothic soap opera, Dark Shadows on the television or seeing the latest horror movie at the Allison Theatre in Piedmont when he could wrangle fifteen cents from his mother. He adored reading Edgar Allan Poe’s horror stories, especially The Gold Bug and The Black Cat. He must’ve read each of them a dozen times and every time they thrilled him more. Knowing the outcome of the story somehow made the build-up even more titillating. Worthy of any Poe story, the abandoned, once elegant hundred-year-old Victorian house was the twin of a second abandoned place, nearer Jim’s house. Both were festooned with turrets and gables. The lacy gingerbread decorations were silvery grey, broken and decaying. With its ancient green paint faded and peeled almost into nonexistence, the house stood dark and sinister like a silent sentry nestled amongst tall, slender pines, majestic oaks and pear trees gone wild. Most of the dozens of window panes were broken, leaving only gaping, baleful black holes staring out onto the road. The front door stood open, having fallen away from the top hinge, as if beckoning inquisitive young boys into its dark and dangerous entrails. The shrubs were overgrown and tangled like the webs of a tribe of maniacal spiders. The once lush, grassy lawns were now just a drab, matted carpet of dead and dying weeds. Everything about the place was in advanced stages of decay. In contrast to the other house, the entire property was surrounded by an ornate rusty iron fence with pikes that had been sharpened to razor-like points by the passage of time and eroding rains. Two paneless gas lamps guarded the gate as though no one had remembered to tell them the family they once lighted the way for were long since gone. Sister’s opinion: 5* “I have read the free preview and couldn’t wait to buy and read the rest. I am very proud of Jim for finally putting his stories and memories to print. This book is very real and will hopefully inspire people to make such memories for themselves and their children. I’ve tried to tell a simple story of a young boy torn between his love of his family and doing what he knows in his heart is the right thing to do. Not an easy thing for a 13-year-old boy to contemplate. I wonder what you might do in a similar situation? Pop on over to Create Space today, get your copy, and let me know what you think of it! 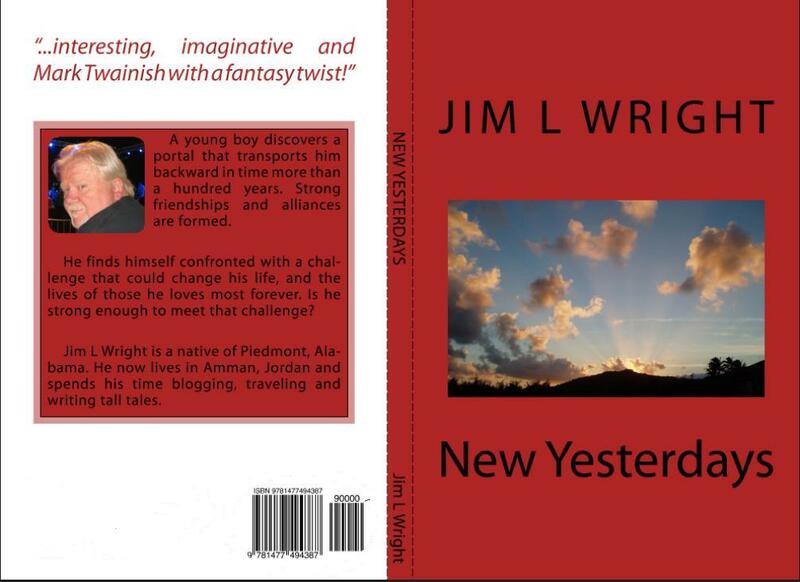 This entry was posted in Wright Tales and tagged book, New Yesterdays, northeast alabama, paperback, reviews, writing. Bookmark the permalink. Thanks Jaraad! I hope you’ll read and enjoy it! Wow, how exciting! My dream to do a book and illustrations one day, but nice to see someone actually doing it. Thanks so much for stopping by! It’s available now at Amazon, pick up a copy and let me know what you think! I’ll give it a shout – good luck with it. i had no idea you published a book! congrats! Sure did! Hope you’ll read it and give me a review!